Ernst Mach made many significant contributions to the fields of wave dynamics, optics, mechanics, and more. 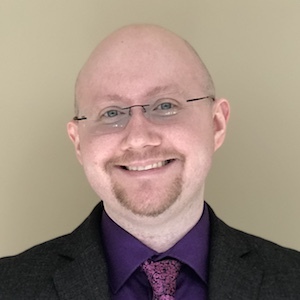 A physicist by education and profession, his interest in psychology and philosophy sharpened his thoughts about physics, helping him make connections that he might not have otherwise made. In particular, Mach’s outlook on how we experience sensations from external stimuli informed his approach to physics experiments and led him to exciting discoveries. Ernst Mach was born on February 18, 1838, in what is now the Czech Republic. His father was a tutor, and he was educated by his parents at home until the age of 14. Mach briefly attended high school before enrolling at the University of Vienna when he was 17. He studied physics there and earned a doctorate degree in 1860 with his dissertation on electrical discharge and induction. Ernst Mach. Image in the public domain in the United States, via Wikimedia Commons. Interested in a teaching career like his father, Mach lectured on various mechanics and physics topics for the next few years in Vienna, before landing a full-time position as a professor of mathematics at the University of Graz in 1864. The lectures he gave were about popular science topics in the fields of optics, acoustics, and psychophysics. These subjects got Mach interested in an interdisciplinary approach that he ended up using in both teaching courses and physics experiments throughout his career. 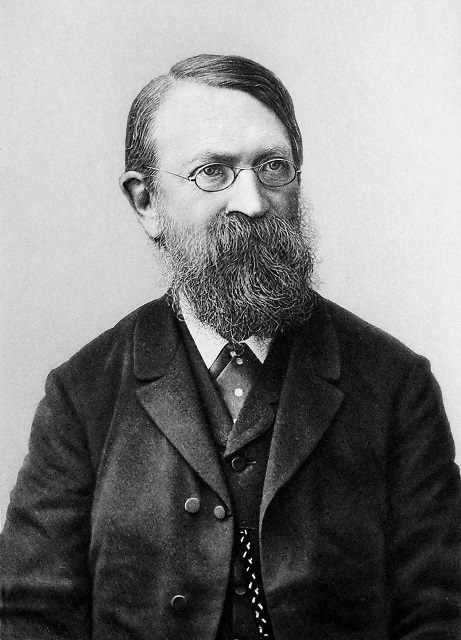 While earning his doctorate and lecturing in Vienna, Ernst Mach worked closely with his professor, Andreas von Ettingshausen, who was Christian Doppler’s successor as the school’s chair of physics. This close degree of separation to Doppler inspired Mach to find ways to support and defend the theories about the Doppler effect. Doppler had observed that when a source moves away from an observer (or vice versa), the sound of the source changes in frequency or wavelength. Today, it’s easy to notice this change in pitch when an ambulance drives past you, but during Mach’s time, the Doppler effect was contested by critics. Some people didn’t think the Doppler effect was real, while others doubted that the theory extended to all waves, not just sound. To demonstrate that the Doppler effect is indeed real, Mach devised an experiment consisting of a long tube with a whistle attached to the end that rotated vertically. If you stood close to this contraption in the plane of the axis of rotation, you wouldn’t hear a change in sound at all — but if you stood in the plane of rotation instead, you would hear fluctuations in pitch corresponding with the speed of the tube’s rotation. The debate was settled…at least for sound. The Doppler effect in light would remain something of a mystery during this time, but thanks to Mach’s experiments, we’ve come to understand that we can apply the same principle to a star’s spectrum to study whether it is moving toward us or away from us — and Mach is credited as the first scientist to realize this possibility. Ernst Mach’s powers of observation didn’t stop with the Doppler effect. In the same decade, he discovered phenomena that we now call Mach bands, which connect the mind, senses, and sensation. Essentially, a Mach band is an optical illusion that illustrates visual perception and the psychological effect of spatially distributed light stimuli. When you look at an image with different shades of gray (illumination) right next to each other, your eye will exaggerate the contrast between the edges, and you will see thin bands near the boundary between two shades. These “bands” are caused by your eye helping you see object edges you might not notice otherwise, through a process called lateral inhibition. Gradients showing Mach bands. Image in the public domain, via Wikimedia Commons. In 1867, Mach became a professor of experimental physics at Charles University in Prague. In the following decades, he continued his studies and discovered phenomena that would eventually lead to more namesakes. For example, after finding a way to measure sound waves and sound propagation using photographic techniques, he laid out the principles of supersonics (for which he is best known) and the Mach number, which represents the ratio of the velocity of an object to the speed of sound in a medium. During his years as a professor in Prague studying supersonic fluid mechanics, Mach confirmed the existence of shock waves and photographed the shadows of both spark and ballistic shock waves, using a bullet as the object moving faster than the speed of sound. 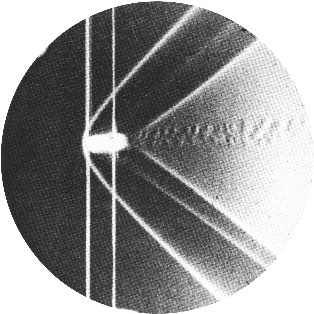 A photograph taken by Ernst Mach in 1888 depicting the shock waves around a supersonic brass bullet. Image in the public domain in the United States, via Wikimedia Commons. Mach is also known for a guiding principle of Albert Einstein’s theory of general relativity. Mach’s principle (while imprecise) posits that the inertia of something in motion originates from how that object relates to the rest of the matter in the universe. In other words, the inertia of a completely isolated body wouldn’t make sense; inertia is determined by the environment. Later in life, Ernst Mach returned to Vienna, where he taught inductive philosophy and was appointed to the Austrian parliament. He continued to write about physics in his later years and published an autobiography in 1910. Today, in addition to studying his influences in physics, you can visit his likeness in City Hall Park in Vienna. Also, a lunar crater and an asteroid are named after Mach in his honor. 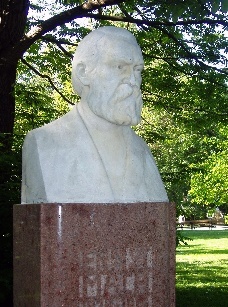 A bust of Ernst Mach in City Hall Park, Vienna. Image by Daderot — Own work. Licensed under CC BY-SA 3.0 via Wikimedia Commons. Join us in wishing Ernst Mach a happy birthday!